While occasionally showing confidence in 2018, Los Angeles homebuyers had a difficult year grappling with rapid home price growth, continually declining inventory, and higher mortgage rates. As a result, total home sales were down by 11 percent year over year in 2018. Fewer home sales were recorded across most Los Angeles communities except Malibu, which posted a 6 percent increase in sales over 2017, and South L.A., with a 1 percent increase. 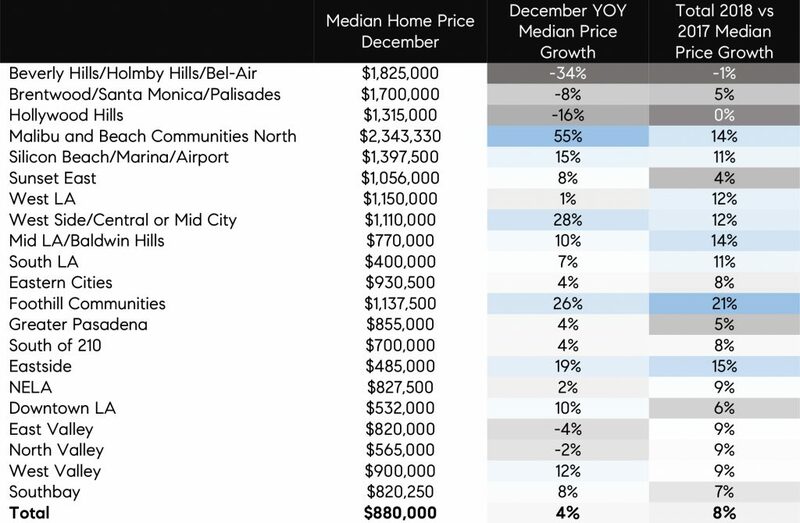 Among sales of homes priced between $1 million and $2 million, which remained on par with 2017, two areas showed particularly strong increases in sales: Mid L.A./Baldwin Hills and NELA, both up by about 70 percent from 2017. Both areas have seen high buyer demand over the last couple of years, driving the median price to above $1 million. NELA for example, saw 80 percent of homes sell for more than asking price at the end of 2017, which fueled price growth in 2018. The growth of sales in the $2-million-to-$3-million range also posted a slight increase over 2017, up by 3 percent. 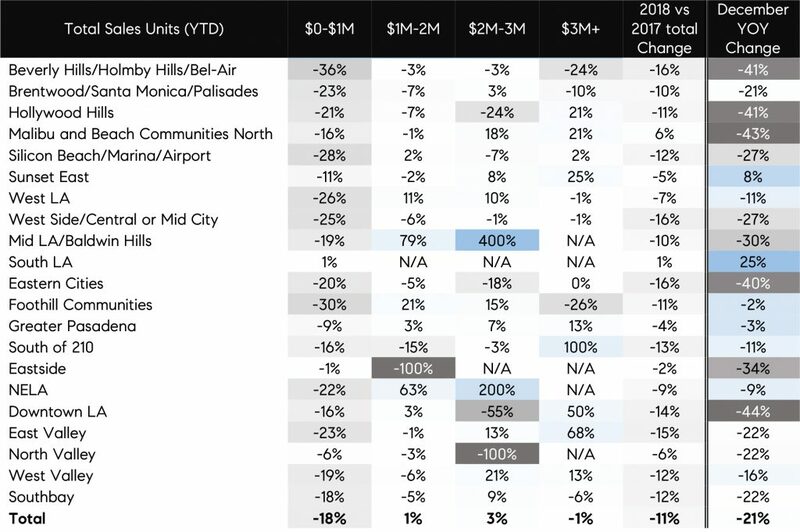 And while sales growth dominated in Mid L.A./Baldwin Hills and NELA, the surge came on the heels of very low levels in 2017. The West Valley, the Southbay, West L.A., and the East Valley also saw relatively more sales of homes priced between $2 million and $3 million. For homes priced above $3 million, a relative jump in sales appeared South of 210 and in Downtown L.A. and the East Valley, again an increase that followed very low previous levels. 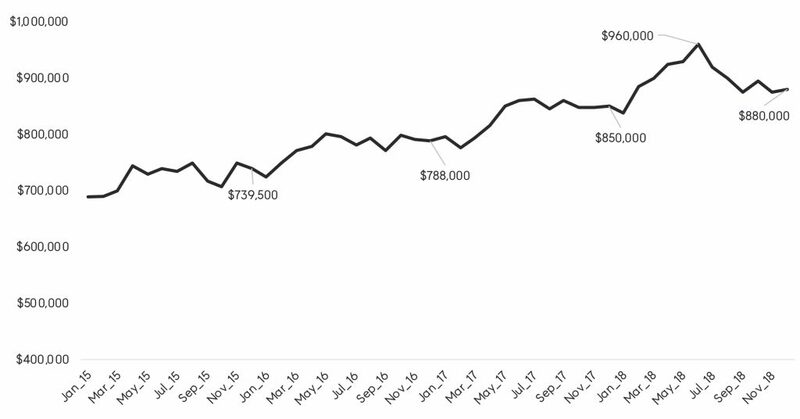 Figure 1 summarizes year-over-year changes in the number of home sales in 2018 compared with 2017 by price range and Los Angeles neighborhood. The last column indicates year-over-year changes in December. 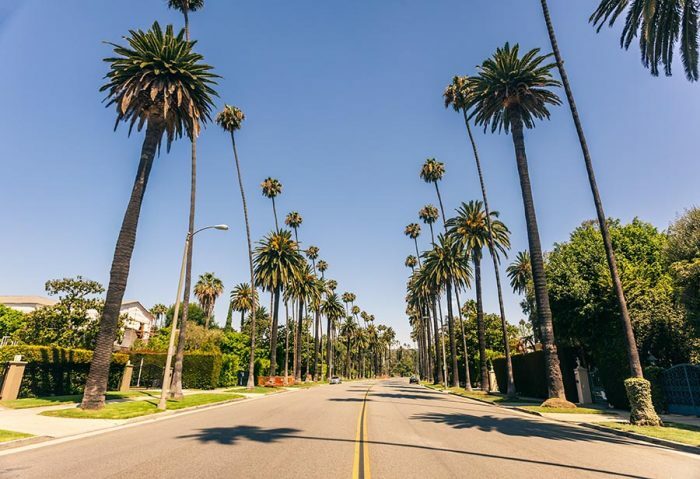 Los Angeles posted a 21 percent year-over-year decline in sales in December, which were widespread throughout the region, though some of the largest decreases were in areas closer to the beach and those affected by the Woolsey Fire — Malibu and Beach Communities in particular. However, slower 2018 sales activity was largely driven by a 20-month trend of falling year-over-year inventory, which started around the beginning of 2017. The declining inventory trend finally reversed in the fourth quarter of 2018, when most regions started to see an increase from the year before. And at the end of the year, there was on average 8 percent more inventory compared with the fourth quarter of 2017. Nevertheless, even with the last quarter’s increase, inventory still falls below fourth-quarter levels recorded in 2016 and 2015. Most importantly, though, is to finally see more inventory for homes priced below $1 million, as the region struggles with lack of affordability. In the fourth quarter, the inventory of lower-priced homes increased by 6 percent from the fourth quarter of 2017, which translates to 251 properties. 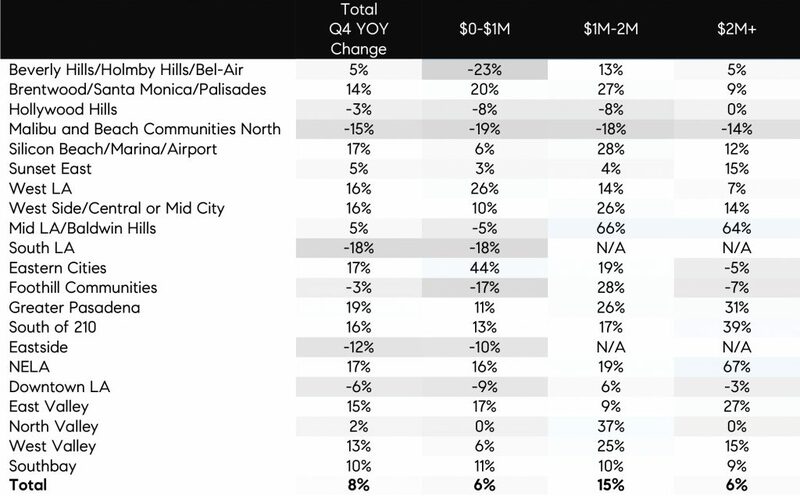 And while the relatively largest increase was in Eastern Cities, up by 44 percent; West L.A., up by 26 percent; and Brentwood, up by 20 percent, the largest contribution to the increase came from the East Valley (up by 78 homes), the Southbay, (up by 60 homes), and West L.A., (up by 52 homes). The increase in lower-priced inventory is again a welcome reversal of trends and should help encourage some prospective buyers who have been sitting on the sidelines. Figure 4 highlights the changes in the share of homes selling for premiums between May and December 2018 by local community. 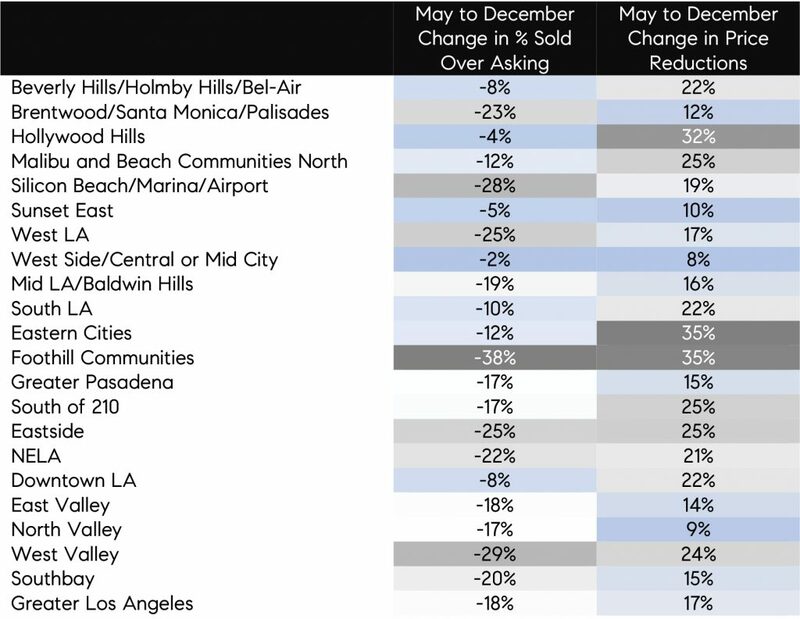 Buyer caution was most notable in Foothill Communities, with a 38-percentage point decline in homes selling for premiums, from 64 percent in May to 26 percent in December. In conclusion, housing activity in Los Angeles ended 2018 with less enthusiasm than it began. There were overall fewer total sales in 2018. However, it’s important to keep in mind that inventory shortages persisted through most of the year, holding back many buyers who were looking for a home. Also, the significant price growth that dominated the early part of year was not sustainable for much longer and to a large degree turned off many prospective buyers. Thus, the rebalancing of seller and buyer expectations was inevitable. Nevertheless, normalizing trends are a welcome change, as is the increase in affordable inventory. Also, with the recent declines in mortgage rates and the anticipation by the Federal Reserve and its observers to see only one rate hike in 2019, Los Angeles buyers are looking at a relatively more favorable year and more certainty around mortgage rates.